1 to 13/8 inches wide, the mosquito fern is a free-floating, green plant that occupies quiet waters and ponds with limited wind. Mosquito fern can be brown or brownish red in color as well, and can be very invasive if mixed with duckweed and watermeal. It can cover the whole pond, blocking out sunlight and oxygen, so it should be controlled if rapid growth begins. 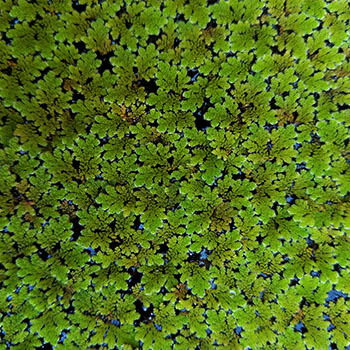 Azolla can be found commonly in Arizona, Louisiana, Florida, and North Carolina, however, it can be found most anywhere in the United States. We recommend Clipper Herbicide for treatment of Azolla. These products can be purchased on our website.